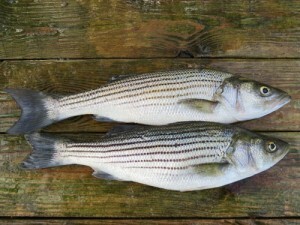 The striped bass or “rockfish” is delicious fish for the table. Smaller striped bass are delicious fried, broiled, grilled, or baked. Larger fish have firm, flaky meat, which is suitable for grilling, broiling, fish cakes, and other cooking methods. A few simple steps are important in caring for striped bass prior to cleaning. Fish should be stored on ice and laid out flat until cleaned. Several cleaning methods exist; The fish can be scaled and the skin left on, filleted and then skinned, or the skin can be cut around the perimeter of the fish and pulled off with pliers prior to filleting. The skin-on method works well for fish that will be baked or grilled. Skinning the fish before filleting has some advantages, the most important being speed. Filleting the fish and then cutting the skin off removes the most dark meat and leaves the highest quality portion, although some fish is lost in the process. These methods also work for hybrid striped bass, white bass, and similar species.